I was not sure if this cake would turn out good or not. First, I am not a coffee drinker, I don’t even know how to brew a cup of coffee. Second, I couldn’t find a recipe that is light in sugar and flour, the ones found online were more dense. Since my friend gave me a pack of instant black coffee, I decided to give it a try. 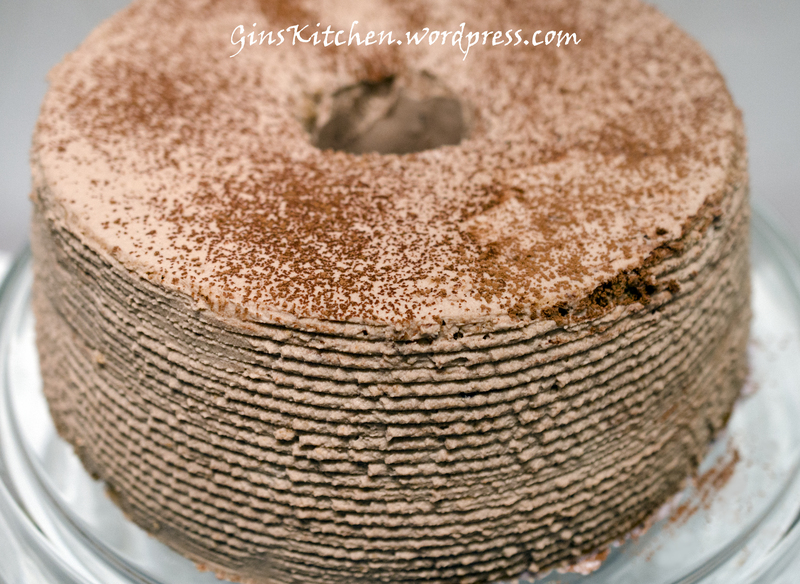 Again, I created this recipe based on Christine Ho’s black sesame chiffon cake which is the first chiffon cake I posted on my blog. The cake was decorated with whipped cream frosting, it was very moist, light and fluffy in texture. 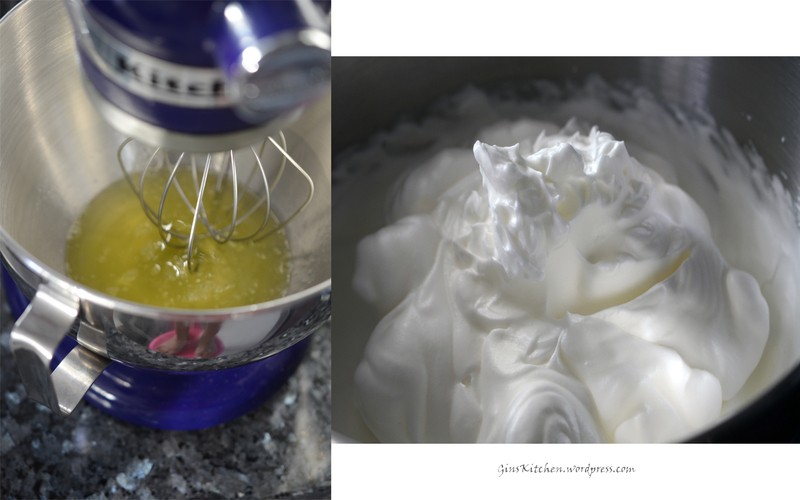 Please scroll down to the bottom for the whipped cream frosting recipe. This cake was gone in one day!! To separate eggs, place 3 small bowls side by side. Crack the first egg and pull the shell halves apart. Pass the yolk back and forth, letting the white fall into the first bowl. Put the yolk in the second bowl. Transfer the white to the third bowl and repeat with the remaining eggs. By doing it this way, if you have one bad egg, you do not need to discard all egg whites. Beat the egg whites with an electric mixer until bubbles form. It is best to begin at a slow speed and gradually move up to high when beating. Add cream of tartar. After mixing well, add 90 grams of sugar in three batches, about one-third at a time, and beat well between additions. Continue to beat until the egg whites are stiff and glossy. Don’t over beat it, overbeaten whites look lumpy and watery. After baking the first 15 minutes, if you find the cake surface gets browning, reduce heat to 320F. Continue to bake until cooked through. A needle comes out clean when inserted in the middle. I decorate the cake with whipped cream. Please see below for the cocoa whipped cream frosting recipe. Dissolve instant black coffee powder in 1 tbsp. of hot water, set aside. Whip the heavy whipping cream with medium speed until it is smooth and firm, add powdered sugar and whip for another 1-2 minutes. Add in coffee and/or rum and whip for another minute. My friend worked at a restaurant, he told me to use Vanilla Instant Pudding to make the cream more firm. *I only used 1 Tbsp. of rum as my kids are eating this cake. If you prefer to have a stronger flavor, use 2 Tbsp. of rum. Whipped cream can be made ahead of time and stored in the fridge. So happy had another successful attempt at making chiffon cakes. After baking black sesame and marble cakes, I wanted to try an orange flavor. 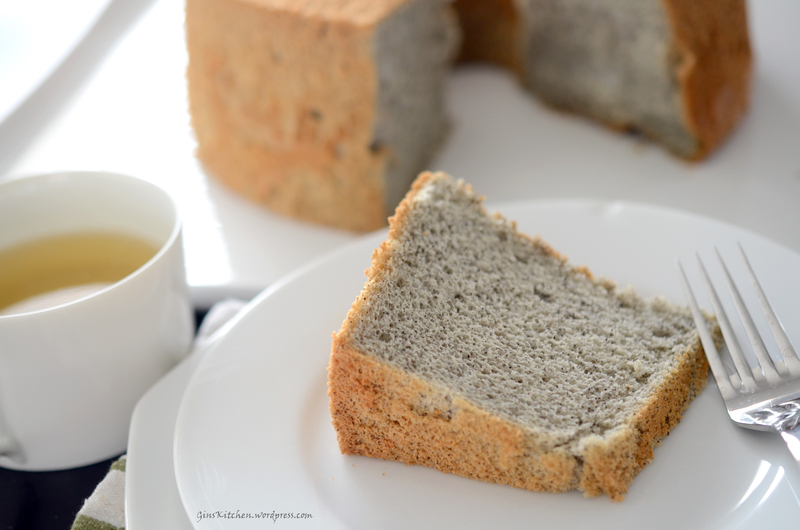 The recipe was based on Christine Ho’s Black Sesame Chiffon Cake recipe. I substituted/added a few ingredients and opted for fresh squeezed orange juice. A tip — It is better to taste the oranges first as sweet oranges will make the cake taste better! I had tried using OJ (100% pure) out of a carton but the orange flavor tasted artificial. Mix egg yolks and 30 g sugar until well combined. Squeeze fresh orange juice from oranges (about 2 oranges) (picture 1). Add orange juice, olive oil, vanilla extract, orange zest, salt into the egg yolk mixture and mix well (pictures 2 and 3). 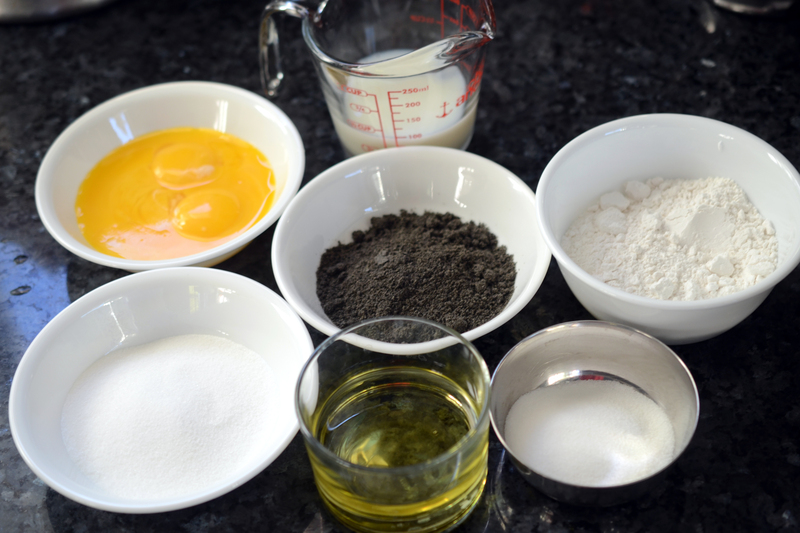 Sift in 80 g flour and baking powder into the egg yolk mixture, mix well to make sure there are no lumps (picture 4). Beat the egg whites with an electric mixer until stiff peaks form. It is best to begin at a slow speed and gradually move up to high when beating. Add cream of tartar to stablize the egg whites. After mixing well, add 105 g of sugar in three batches, about one-third at a time, and beat well between additions. Continue to beat until the egg whites are stiff and glossy. Don’t over beat it, overbeaten whites look lumpy and watery. 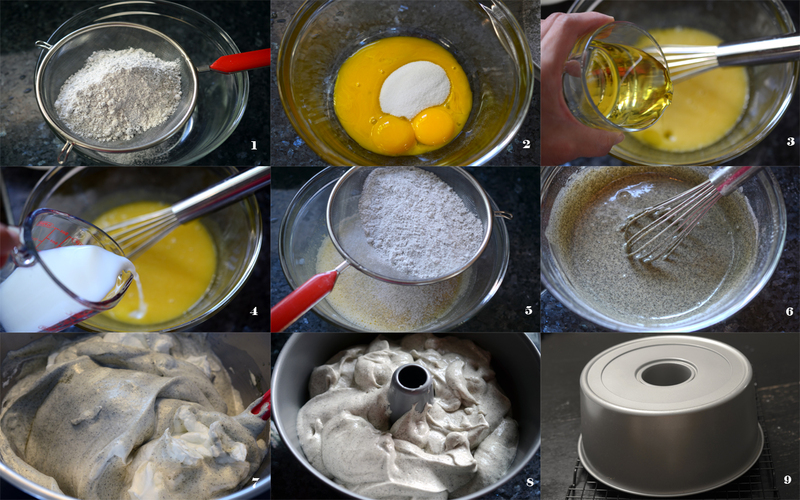 Gently fold-in half of the egg white mixture into the egg yolk mixture and repeat the same with the remaining egg whites (picture 5). 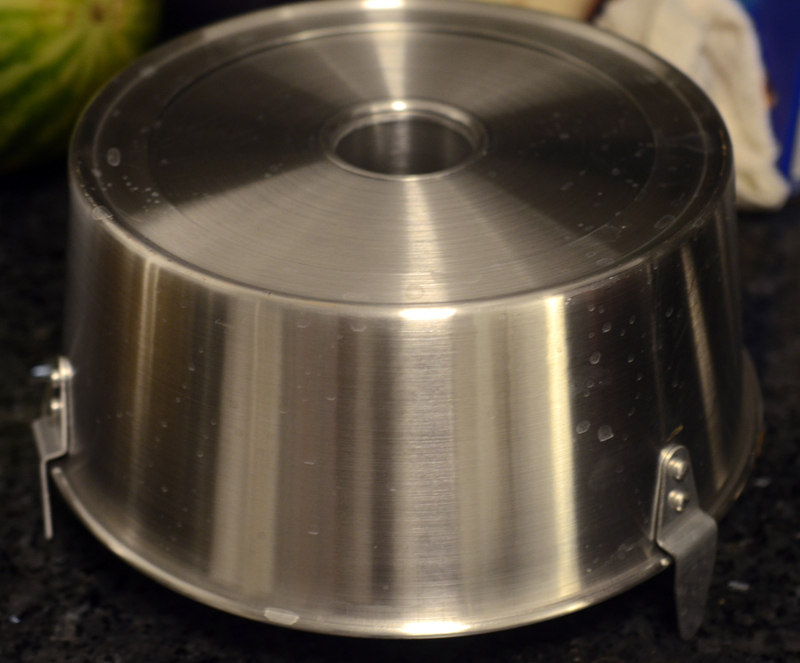 Pour mixture into an 8″ tube pan and bake in the preheated oven for about 40-45 minutes. After baking the first 15 minutes, if you find the cake surface gets browning, reduce heat to 320 °F. 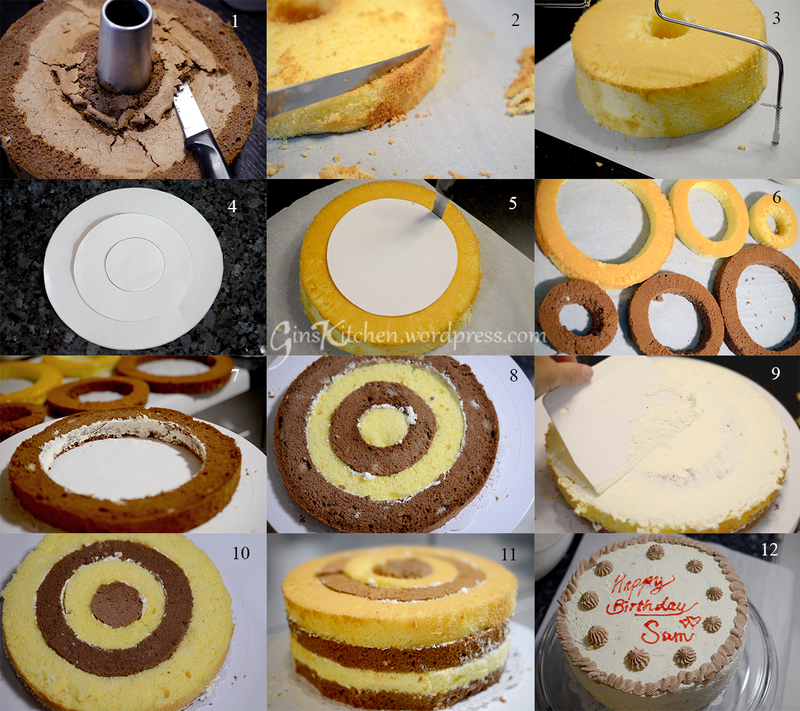 The cake will rise to the top after baking (picture 6). 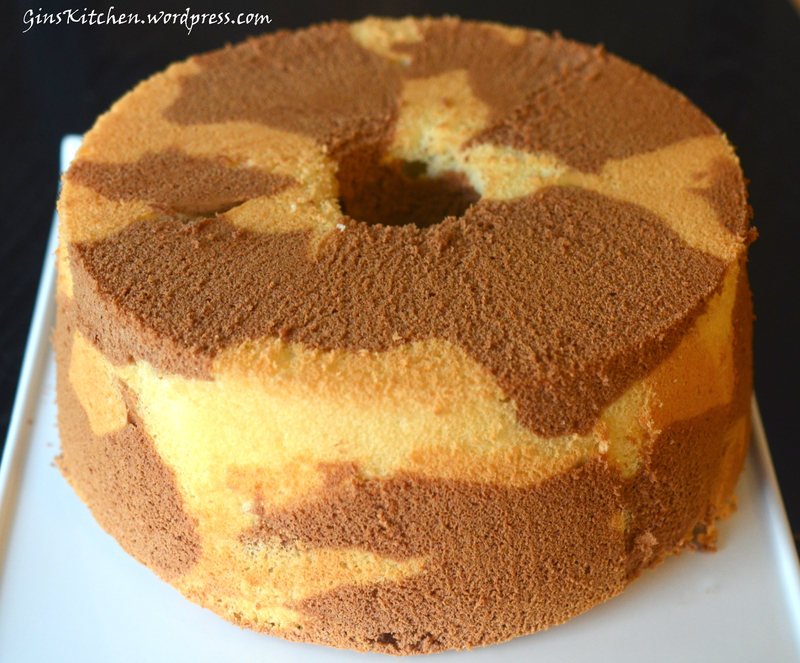 After making the black seasme chiffon cake many times, I wanted to try something different. 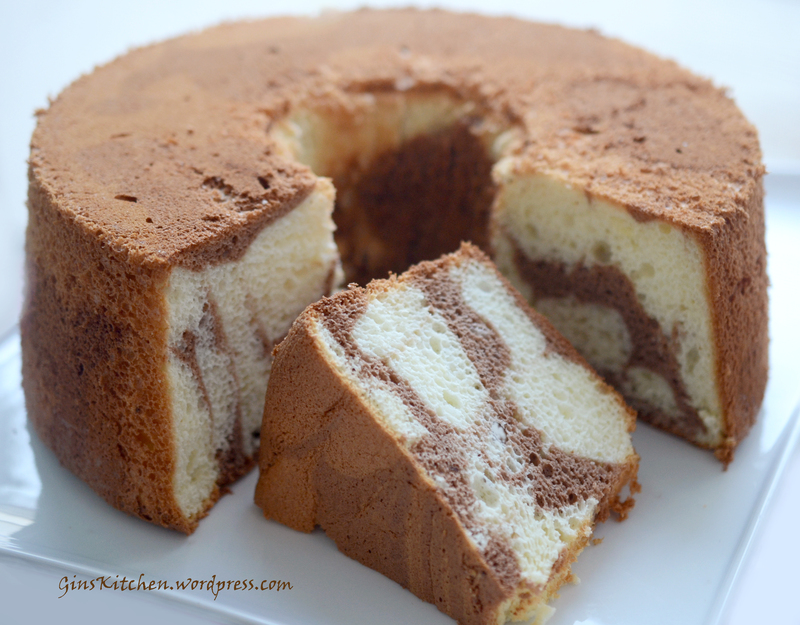 I saw many beautiful pictures of marble chiffon cakes on the internet and had tried different recipes, but none of them turned out to have the taste/texture I liked. So, I decided to go back to Christine Ho’s black sesame chiffon cake recipe and made changes to it. I’m very satisfied with the result and my kids loved it, the cake was gone in one day. Mix egg yolks, 25g sugar, salt and honey until well combined. Add in olive oil and mix well, then add in milk and mix well. Sift in 80g flour and baking powder into the egg yolk mixture, mix well to make sure there are no lumps. 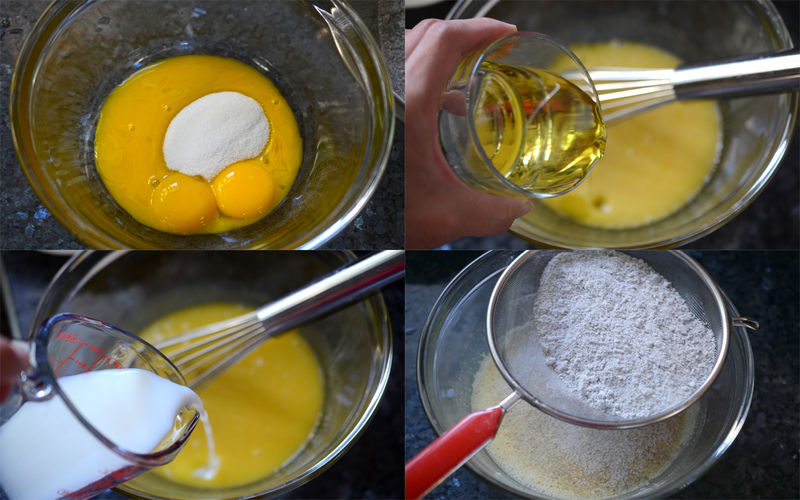 Divide the egg yolk mixture into two equal portions in separate mixing bowls. I got 338g in my bowl, so I put 169g in each bowl. 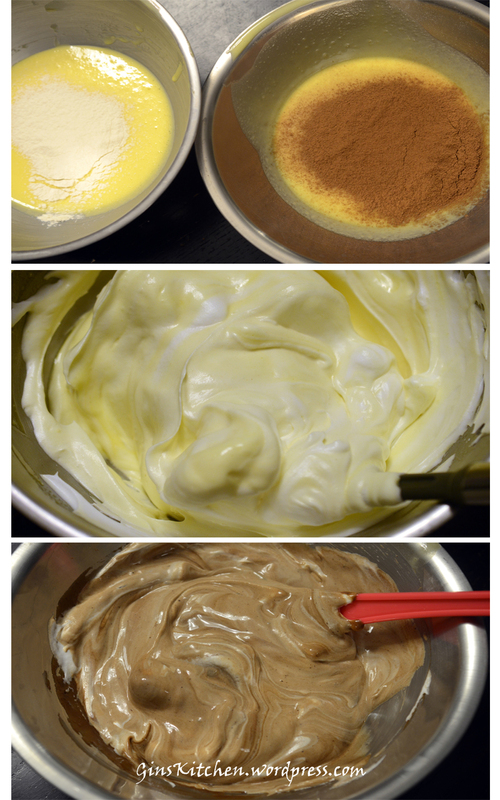 Mix 10g of the flour into a bowl of egg yolk mixture and 10g of cocoa powder into another bowl of egg yolk mixture. Now, beat the egg whites with an electric mixer until bubbles form. It is best to begin at a slow speed and gradually move up to high when beating. Add cream of tartar. After mixing well, add 110 grams of sugar in three batches, about one-third at a time, and beat well between additions. Continue to beat until the egg whites are stiff and glossy. Don’t over beat it, overbeaten whites look lumpy and watery. Gently fold-in half of the egg white mixture into the cocoa egg yolk mixture and half into the plain mixture until well combined. 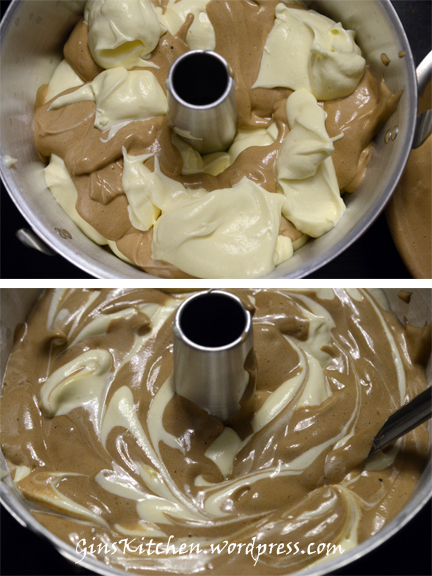 Spoon batters into an 8” tube pan, alternating spoonfuls of plain mixture and cocoa mixture to simulate a checkboard. To create marbling, run a table knife through the batters in a swirling motion. Bake in the preheated oven for about 40 minutes. After baking the first 15 minutes, if you find the cake surface gets browning, reduce heat to 320F. Remove the cake from the oven. Invert the pan immediately on a wire rack. Let it cool completely (at least an hour). Remove the cake by running a knife around the pan, angling the knife towards the pan to try and get the full crust on the cake. 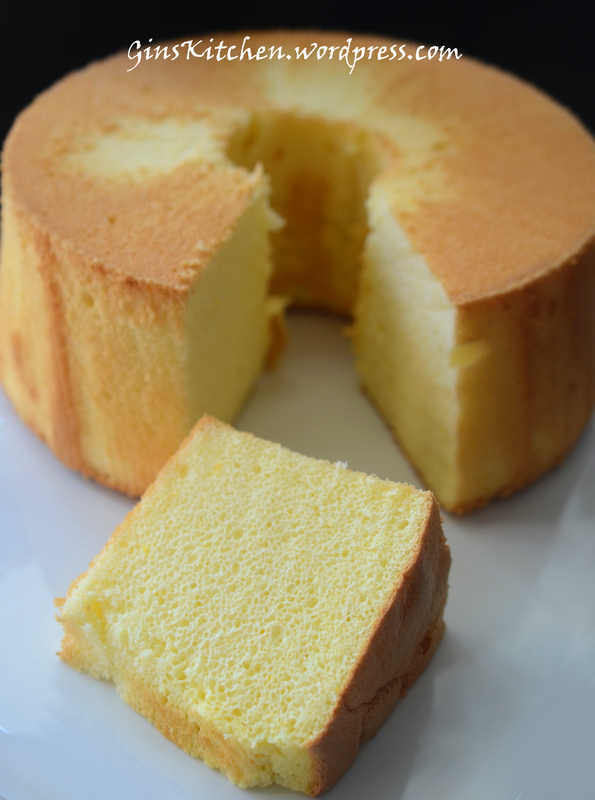 Is there any difference between a chiffon cake and sponge cake? They are quite similar but a chiffon cake calls for oil, its texture is more fluffy and airy while a sponge cake is oil/butter/fat free. 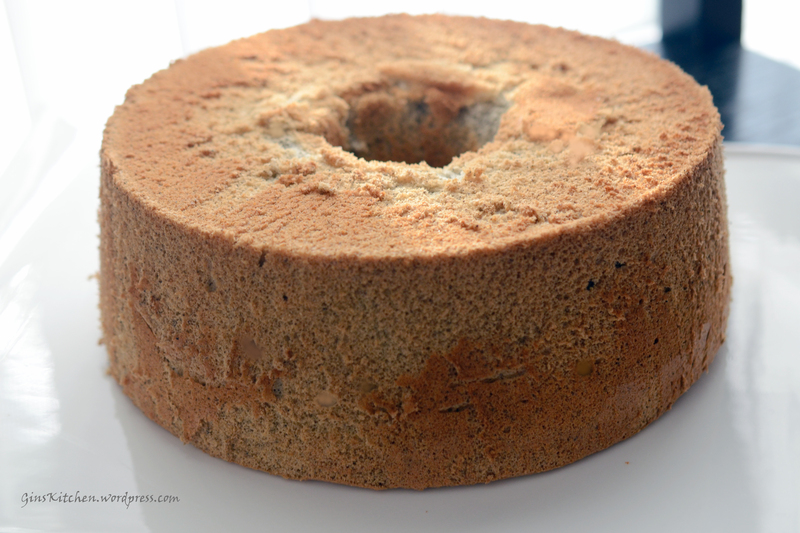 Most people complain that their chiffon cake sunk after cooling or did not rise. 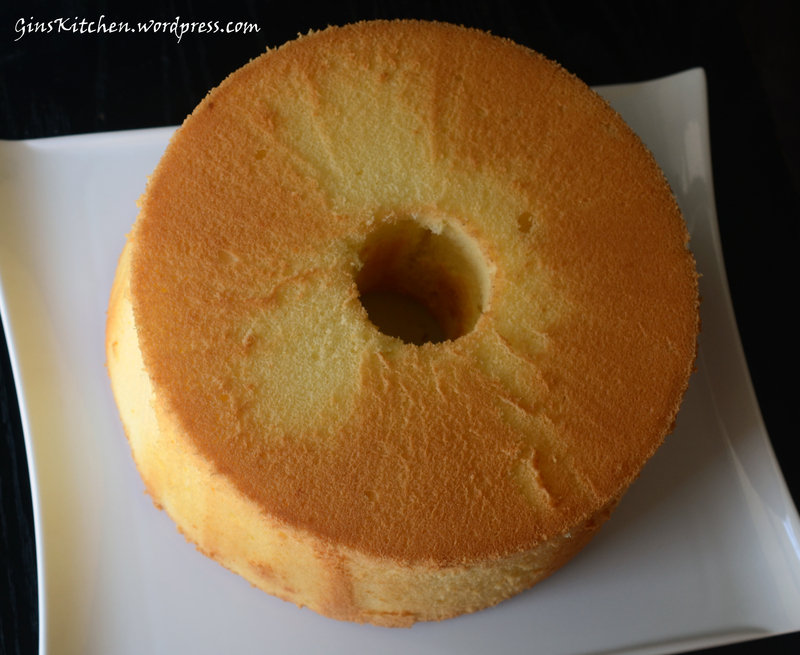 I have made this chiffon cake many times and never encountered any problems. 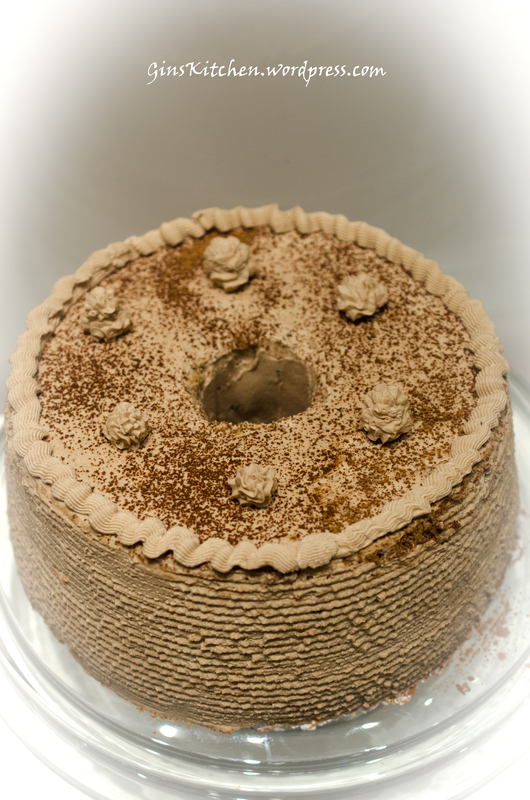 I’m Christine Ho’s big fan and learned how to make this black sesame chiffon cake from her blog. Her tip on how to prevent the cake from sinking is very helpful (i.e. never grease the pan or use a non-stick pan). 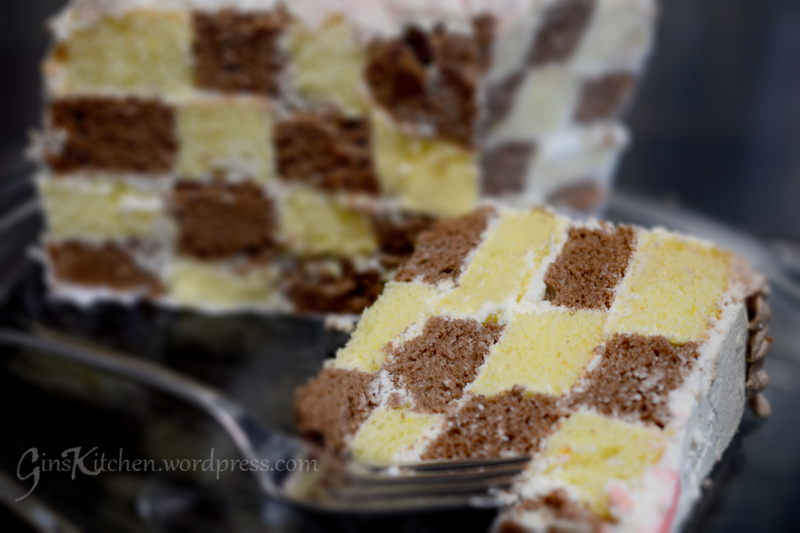 The reason I chose her recipe over many others found on the net is because her cake is so light and the sweetness is just right. I slightly adjusted her recipe by adding more sesame powder and using 6 egg yolks. 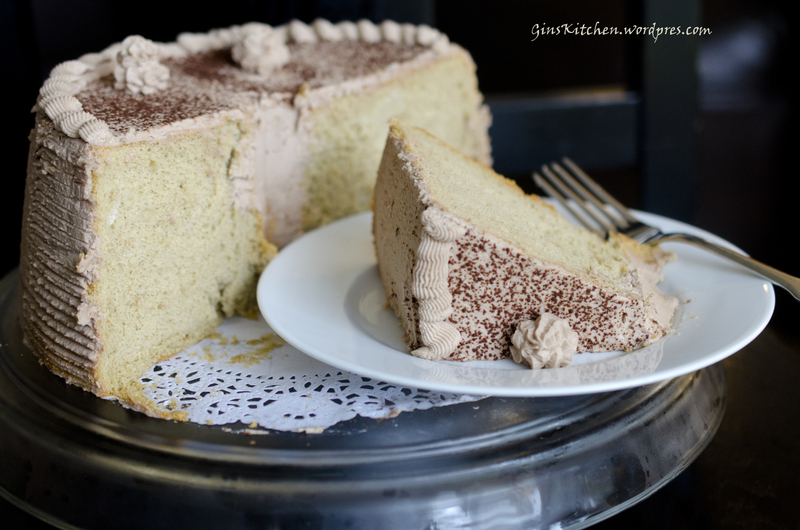 You will love this recipe – it’s easy and the cake is even fluffier and softer than the store-made ones! Beat the egg whites with an electric mixer until bubbles form. It is best to begin at a slow speed and gradually move up to high when beating. Add cream of tartar. After mixing well, add 60 grams of sugar in three batches, about one-third at a time, and beat well between additions. Continue to beat until the egg whites are stiff and glossy. Don’t over beat it, overbeaten whites look lumpy and watery.